Our first night within occasional sight of Domme (when not obscured by murk) passed without disturbance; no drumming on the roof. Consciousness returned gradually at about 7:30 AM. 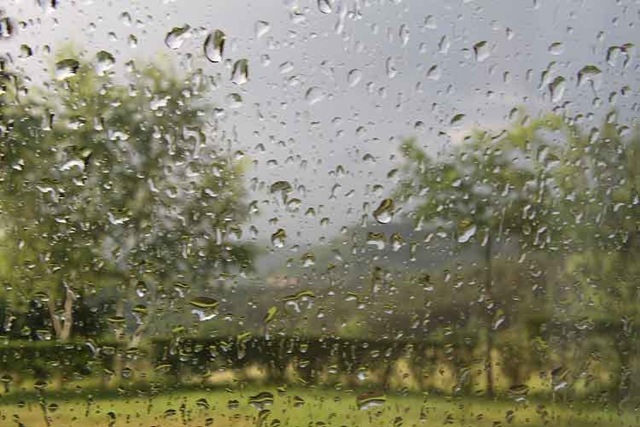 The rain returned gradually at about 7:45 AM. Good Lord, what an uncanny sense of timing. Had it been lurking around just waiting for us to wake up? A friendly Dutch man in a pitch close by (yes, there are other idiots here besides us) was passing as I was outside during a rare and brief intermission. He said that we shouldn’t have brought the bad weather with us. Pointing at some seriously muddy puddles, I remarked that it looked as if there had been several days of rain before we arrived. "It’s been terrible," he confessed, "we’ve had little else for the 5 days that we’ve been here". We needed supplies so eventually I gave up waiting for another intermission, stripped and donned my swimming trunks (old boy scout camping trick to keep clothing dry in adverse weather). Braving the elements and caring little for the sensibilities of any neighbours, I went to remove two sopping wet bicycles from the roof of one sopping wet car. These could then be stored in the shelter of the sopping wet sun-canopy attached to our sopping wet caravan while we visited the local shops. Should the weather ever allow me to mount my bicycle again, the rain soaked up by my in-need-of-replacement sopping wet saddle will be squeezed out, issue forth, and run down the inside of both legs. Most enjoyable – not! 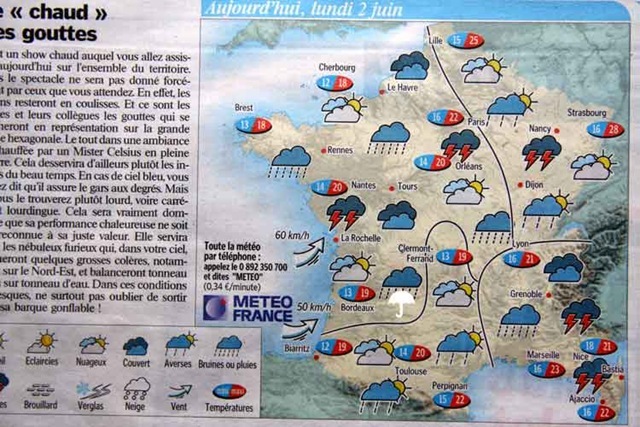 Today’s copy of the Aujourd’hui newspaper, suggests that it may stop raining tomorrow, perhaps eventually giving the sun a chance to peek through the still persistent clouds. (I’ll believe it when I see it.) It may not be great but at this point we’ll take anything resembling dry that we can get. On the right is today’s weather forecast, just to help with the French education. The symbols are pretty self-explanatory. I added the white umbrella to show which humongous great cloud we are under. Oh well, this was predicted. Another Brit couple turned up with a moderately obscene motor van (twin rear axle, but not nearly as obscene as the large Winnebago jobs). 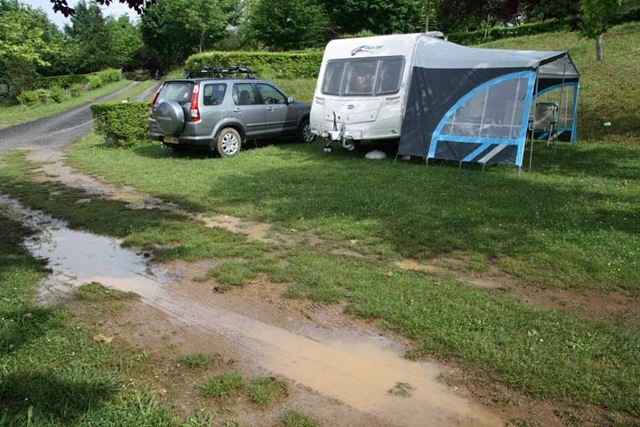 They’d come up from Carcassone, the number one "must see" place in France, in my opinion, and report that the weather there has been the same. They are "full timers"; having sold their house, they now live in the motor home. That saves a whole bunch of council tax. They’d given up trying to get onto a pitch ‘cos the weight of the vehicle was just churning up the mud. 5:15 PM update: the drumming on Billy’s roof has ceased and a strange diffuse glow has emerged. 6:00 PM update: time for a pastis! Just for comparison it is 90F and sunny here.